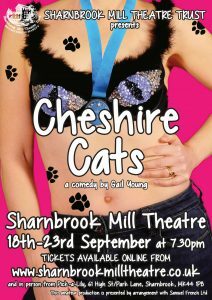 Gail Young’s Cheshire Cats has the distinction of being exclusively ‘amdram’ in its origins, being first brought to the attention of the wider public when performed at the Edinburgh Fringe in 2006 by The Guilden Sutton Players. Even since its publication by Samuel French in 2011 it has remained so, which surprises me somewhat because this is an excellent piece of writing full of great diverse characters, some extremely funny moments and plenty of pathos, perfect one would have thought for touring rep companies…? It tells the story of one group of women from Cheshire who go on the now famous Moonlight Walk in London attended by woman all over Britain in aid of breast cancer signified by wearing bras on the outside of their tops. The charity itself has now laudably raised over £100 million for its very worthwhile cause. In the hands of a top draw group like Sharnbrook Mill Theatre Trust this was never going to be anything other than a first-class piece of entertainment. The set which depicted four places: training in a park, Chester railway station, a train carriage and the actual walk in London was kept very simple with a bare stage with projected back images and the use of pink (being the colour of the charity) chairs to depict such items as a park bench or seats on a train. This together with various items such as a giant stylised cat’s face and a moon at roof height completed what was mainly a very effective set. However, I’m not over convinced the back projection worked that well as it served more to show the audience what scene we were in rather than being part of the actual set. Lighting and sound by Alex McKenzie and Phil Bennett were, as far as I could tell (not being a back stage man), professionally faultless and when I don’t notice them that usually means they have worked to perfection! The costumes from the training leggings to the pink tutu outfits for the actual walk were perfectly suited to the action and all the more so for being mainly cast sourced with a little help from Sue Lander, Virginia Pope and the Walk The Walk charity. Good job ladies! Nicole Macdonald’s direction was pretty much faultless with excellent pace and some neat tricks to the action, great use of all the exits and entrances and a memorable walkdown at the end of the play. But best of all her casting was spot on especially with her six main characters, all of whom demonstrated top draw acting, not a weak link between them. All five of the female leads also nailed the Cheshire accents so well my other half, herself from the North West, stated she felt quite at home. This is a wordy play, with long speeches and the action relying almost entirely on the dialogue. In the hands of lesser actors this could easily lose its audience, but not so here where the pace was relentless, the moods portraited with emotions judged to perfection and the comic timing sublime. Lesley O’Neil as Hilary the control freak organiser determined to complete the walk in record time was the strong glue that held the play together, with a wonderful portrayal of somebody somewhat frustrated by her companion’s lack of enthusiasm for her personal goals. Nicola Hickson as Vicky the youngest member of the group gave a memorable comedic portrayal of lust with her very funny public groping scenes with Andrew. Great comedy! Jenny Tymon-Robbins as Maggie, the enthusiastic but not really physically up for it member of the group whose shortcomings ultimately undid Hilary’s record attempt, was the character with whom you most sympathised. Her final speech certainly brought a lump to the throat. With the possible exception of the lover’s groping some of the best comedy moments were provided by Alexandra Goodbody as Yvonne, sometimes jumping to wrong conclusions and often putting her foot in it. Always great to watch. Lesley Wood as Siobhan was the foil to Hilary’s leadership, cleverly keeping her feet on the ground by putting across the proper reasons for their walk and providing the group with its true team spirit, particularly well demonstrated when insisting on going back during the walk for the struggling Maggie. Tim Jackson-Waite as Andrew certainly brought his own brand of comedy to the table and I have to say it took me a while to get where he was coming from with his larger than life portrayal, but he soon endured himself as the character developed and provided some of the best comedy highlights particularly in his drag costume and of course not forgetting his brilliantly funny groping scenes with Vicky. Even the minor characters in this play produced some great memorable moments, Douglas Pope as the Policeman certainly put a smile on your face as he crept off the stage having caused a traffic accident and the Madge (Virginia Pope) and Ethel (Sue Lander) scene struggling to use a walkie talkie was comedic gold. Emma Legg as the aerobics instructor certainly put them through their paces and Ken Wilde as the Handsome Drunk staggered about the stage in a measured alcoholic state. All in all a thoroughly entertaining piece from a very experienced cast who had clearly put in the hard work on the subtleties and nuances of the complex script. Thank you once again to Sharnbrook Mill Theatre Trust for a great play and your usual warm hospitality. Always a pleasure.